The first day of their Thailand fishing holiday saw the anglers fishing at Bungsamran Lake in Bangkok. Fishing from the public bank the anglers wasted no time in casting out large feeders packed with groundbait on sliding float rigs. With big catfish crashing out all over the lake it didnt take long before one of the clutches screamed into life as a big catfish picked up one of the baits. Winding down into the unseen catfish saw the rod pulled into full curve as line was ripped from the spool. The catfish embarked on a searing run heading for the far bank. Continued pressure saw the catfish turned and guided towards the fishing platform. After a few hairy moments at netting with the fish trying to reach the safety of the snags the fish was finally netted. 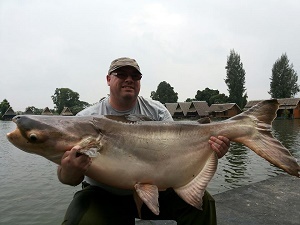 At 25kg the Mekong Catfish was a good start to the day. Further casts saw several Striped Catfish of around 10kg landed in quick succession. As the afternoons fishing wore on the angler added several more striped catfish to their account in addition to a few smallish Mekong Catfish. With only an hour of fishing time left one of the rods was picked up by a slighter bigger catfish. After embarking on a circuit of the lake the catfish stayed deep and didn’t show itself for almost fifteen minutes. When the catfish finally surfaced for a gulp of air it could be seen to be well over 40kgs. The mekong Catfish continued powering up and down the margins for several more minutes before it was finally ready for netting. After bringing the fish onto the platform trophy shots were taken and the fish was estimated to weigh possibly 45kg. Several more fish were caught in the convening hours before the days fishing came to a close.